Welcome to the start of the October Monster Drawing Challenge. For those unfamiliar with the concept; I started this idea last year where each day of the month of October, I would draw a monster or creature from myth, folklore, or cryptozoology and post them either here or on my art profile. Its a fun little exercise and I hope to continue it. 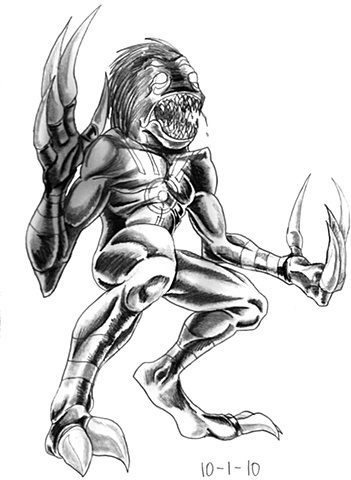 The first monster I have up for today is a vicious demon from Inuit mythology, the Kigatilik. It is considered a violent monster that is mostly known for killing shamans and is similar to a tribe of spirits called The Claw People. This creature I followed based on that title of its possible association of The Claw People by giving it vicious claws and using my plans for the Wendingo (coming soon) as its body, albeit I made Kigatilik more muscular than my plans for the Wendigo (coming soon). I gave it various markings and a mouth lined with shark teeth, plus a full head of hair. I gave some markings above its head to give a set of eyes, but I left them designed as "false eyes" so thats my interpretation of the kigatilik.